DETROIT -- Mike Shook gathered all 36 employees of Lewis Chevrolet-Cadillac in the service shop just after closing on a Monday evening this month to share some good news. Shook, general manager of the Garden City, Kan., store, had been informed hours earlier by his General Motors zone manager that the dealership had hit its sales target for 2011. The reward: Lewis Chevrolet-Cadillac gets to keep its doors open. For Shook's store and about 120 other GM dealerships, 2011 was a do-or-die year. During GM's 2009 restructuring, those dealerships were among the 2,064 that GM sought to wind down. The automaker eventually agreed to reinstate about 700 that had filed for arbitration. Of those, GM required about 120 to create fresh business plans and agree to meet individual targets for 2011, ranging from sales volumes and customer-service scores to capitalization and profitability, several dealers say. The penalty for missing any of those objectives: franchise termination. "It was sink or swim," says Shook, who last week signed fresh five-year sales and service agreements for Chevrolet and Cadillac, the standard term. "Our people went all in for this. It's a big relief for them." During the past two weeks, GM has been delivering either good or bad news to each of those 120 dealerships. The company won't say how many now face termination because they missed their targets. The "vast majority" hit their numbers and will keep their franchises, a GM spokeswoman says. For the "very small number" that didn't, GM either will exercise its right to acquire their assets or terminate their franchises, depending on the terms of the agreement the dealers signed in 2009 or 2010. It took GM several months to get a final count on the dealers' performance metrics from 2011, the spokeswoman says. Dealers are accustomed to gunning for factory-set sales objectives in one form or another. Typically, thousands of dollars of bonus cash are on the line. But having dozens of employees' jobs and the family business at stake made for a year of jangled nerves and sleepless nights for many dealers. The make-or-break scenario is a reminder that, even three years later, many dealers' day-to-day operations are still reeling from the deep and jarring disruption caused by GM's restructuring and abrupt paring of its retail network. 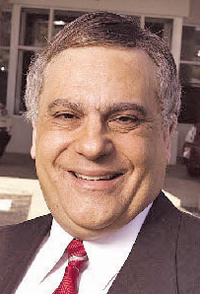 Bill DeLord, owner of Bill DeLord Buick-GMC-Cadillac in Lebanon, Ohio, needed to average about 15 Cadillac sales a month last year to keep the franchise under the agreement he signed with GM in 2009. He says he "just achieved" the sales target he needed, declining to disclose the number. "It was a lot of uncertainty that weighed heavily on me, my family, my employees," DeLord says. But he has emerged from the harrowing process with a renewed appreciation for his 43-person staff, none of whom quit despite the threat of losing the Cadillac business. Customer retention improved under the "gain-and-retain" mantra that employees adopted. The dealership quickly implemented courtesy-transportation and roadside-assistance programs. Both programs were prescribed by Cadillac but embraced by DeLord's staff with far more enthusiasm than before, he says. Today, for example, every Cadillac that enters DeLord's service bays leaves gleaming clean. "We all knew what we had to do in order to save the franchise, and we elevated our game," says DeLord, a first-generation dealer who opened his Oldsmobile-Pontiac-Buick-GMC store in 1993 and added Cadillac in 2006. "I saw an energy and a cohesiveness and a coming together that I've never seen before." Not all the dealers who faced the all-or-nothing challenge used it as a rallying cry. The general sales manager at a Chevrolet-Cadillac store in the Midwest, who didn't want his name published, says he and the other managers never told employees about the conditions GM was requiring the store to meet because they feared some employees would walk. He says: "It was like coming to work every morning with a gun to your head to sell more cars." Shook's store ended up breezing past its sales bogey, which required it to hit a "retail sales index" determined by the store's market share for its primary sales area. That worked out to an objective of about 180 new-car sales for 2011. Lewis Chevrolet-Cadillac sold 270. As the year wore on, Shook and his team felt good about the sales pace. But because the target was based on market share rather than an absolute number, they could only guess whether it would be good enough. It didn't help that the interim data provided by GM were dated by a few months. Shook bought local vehicle-registration data from R.L. Polk & Co. to try to determine the store's local market share. Profitability took a hit in the quest for sales, as staff members cut deals that they never would have before. "If it was in the black, it went," Shook says. "It didn't matter if it was $1 or $500" in gross profit. "We probably cut loose a lot more deals than we ever did in the past." He boosted the minimum sales commission to $400, from $300. Shook also pumped up his advertising by 75 percent for 2011. The store began sponsoring halftime promotions at the local high school's football and basketball games -- for example, giving away a hundred bucks for fans who nailed a 20-yard field goal attempt. Shook says GM allocated plenty of inventory so he could meet his target. But other dealers said a lack of vehicles was the biggest obstacle in meeting their goals. For most of the 120 dealers, GM had cut off vehicle deliveries during parts of 2009 and 2010 because of their wind-down status. That meant many weren't getting enough cars and trucks under GM's "turn-and-earn" system to hit their 2011 objectives. DeLord figured that he needed around 50 Cadillacs on his lot at any given time to hit his sales bogey. During the first half of the year, his inventory hovered around 35 units. He was forced to make up the difference by buying cars from brokers and other dealers. "We had to achieve these numbers, but we didn't have the inventory to do it," DeLord says. "The turn-and-earn didn't keep up." Dealers say they had quarterly meetings with their GM zone managers and field reps, who offered counsel on how best to execute their new business plans and hit the required targets. Holly Chevrolet, of Marion, Ark., near Memphis, Tenn., was another dealership on the probation list. Lannie Lancaster, the dealer principal, said his quarterly meetings offered insight into how his inventory and pricing stacked up against those of other dealers. One meeting in the third quarter convinced him that he needed to drop the transaction price on most Silverado pickup models, which helped accelerate sales. Overall, Holly Chevrolet's sales jumped 71 percent in 2011, which just barely met his sales objective. On June 4, he got word from GM that he had met his targets and would get a new five-year franchise agreement. He called a staff meeting to share the news with his 20 employees. "There was plenty of excitement," Lancaster said. "We'll probably have a cookout."